Desert Pines’ Greg Floyd will reclassify to the class of 2018 and attend Middlebrooks Academy (California) for the upcoming school year, Jaguars basketball coach Mike Uzan confirmed Wednesday..
Desert Pines’ Greg Floyd will reclassify to the class of 2018 and attend Middlebrooks Academy (California) for the upcoming school year, Jaguars basketball coach Mike Uzan confirmed Wednesday. 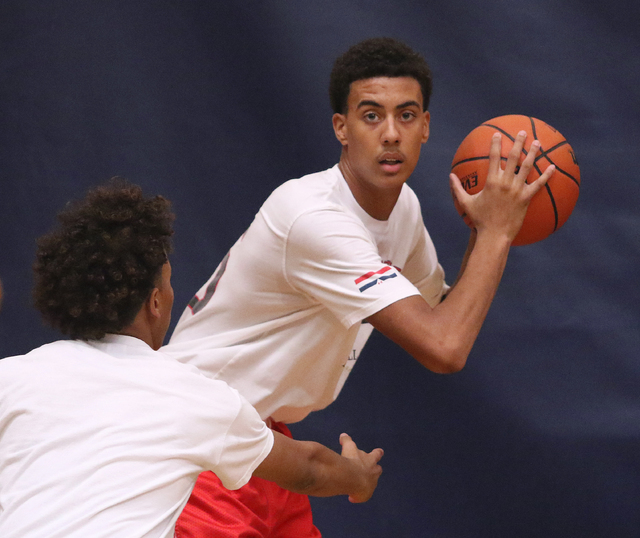 Uzan said the 6-foot-9-inch forward, who would have been a senior at Desert Pines, had been considering the move all season and made up his mind with his family within the past few weeks. Floyd, a four-star prospect, according to ESPN, already has scholarship offers from several schools, including Arizona, California, Georgia Tech, Memphis, Miami, Oregon, San Diego State, Seton Hall, UNLV, USC, Virginia, Washington and West Virginia. Floyd previously transfered to Desert Pines after spending his freshman year at Clark. He is the second local player to reclassify and attend Middlebrooks Academy in the past two seasons. Tyler Bey, a former Las Vegas High standout, reclassified from the class of 2016 to 2017 and transferred to the prep school last season. After moving to the class of 2017, Bey has received an influx of offers from Pac-12 and Mountain West schools. Floyd and Bey have both played for the Las Vegas Knicks, a local travel circuit team.